Normally, wining and dining is fun if it is done in an environment with cool ambiance and with the right team of event planners. In Roseville, CA we prepare exquisite and delicious authentic mexican dishes for your pleasure and this is all done at a cost which you can really afford. In an effort to exceed your expectations, we use only fresh nourishing ingredients and an appetizing local produce. Finding a good local caterer in Roseville can be a bit difficult. Especially among clients that seldom cater an event. This article covers a situation where you or your organization wants to have a party or you are organizing a big event where a large amount of people will be in attendance. In this piece, we will walk you through on how you can save money when you pay for our four basic catering service. Social events cover a large range of events and this can be from retirement parties to big birthday celebration. In this case, we can assist in creatively making it colorful with our custom Taco Bar. Accent the buffet area with different types of Mexican flair and decorations to give it an exquisite look and that Pinterest look. In addition, the presence of servers and some well garnished appetizers will further give it a sense of packaging an authentic Mexican feast. It is obvious that locals searching for Roseville wedding catering services have come across all the typical faireand if you’re on this page, you might be thinking about a Mexican Catering option. It’s a great way to make that big day a huge success. EVERYONE loves Tacos! There is still the possibility of saving even when it seems you will spend a fortune. Catering with SBTC is typically 75% cheaper than a seated plated meal and almost 50% less expensive than catering typical fair. All you need is to be a smart event planner who can factor ways on how you can spend less while making sure that special guests and every other person eats and drinks during the ceremony. Catering your Roseville Wedding with SBTC is one of the smartest choices you can make. SBTC is the Roseville Catering Service You Can Count On! 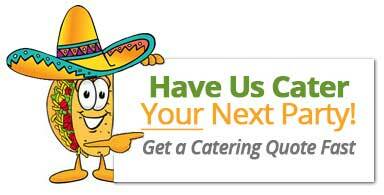 We have catered hundreds of events in Roseville, CA. One thing is for sure, if you are assembling a very large gathering of people, good food is expected and definitely appreciated. The question then arises; how can one satisfy all guests without spending breaking the bank? Especially in Roseville where folks tend to spend a lil more than average on catering their events. Well, this is where a professional service like our comes into play. Understand your budget before placing order – Even though this is usually the first point to note, when planning starts, it becomes the last on the agenda. Now, for you to help yourself, you need to understand what you’re looking to spend before you approach any event planner. Just do some rough calculations in order to determine the amount of food an individual may consume, with the total number of people. Know the number of guests – Similar to what we mentioned above, it’s very important you know how many people you want to feed at the occasion. This will help in making informed decisions on how to budget based on available resources. Making choice on decoration – Organizing any size of event depends on your capacity. If you can, there is a possibility of upgrading to any level of your choice and this can be seen in the integral part of the event like hiring a good DJ, professional chefs and decorating to accent the cuisine being served. This involves a gathering of professionals. It could be official trainings, office party or even a large regional meeting. When plenty of food is delivered to people there, there’s a possibility of saving costs especially because it let’s you concentrate on other important responsibilities at the time.